вЂў Check the A/C high-side pressure. вЂў Before doing symptom troubleshooting, check for powertrain DTCs (see page 11-3). Also check for B-CAN codes (see page 22-109). 8. Turn the ignition switch to LOCK (0). 9. Disconnect the A/C pressure switch 2P connector. 10. Turn the ignition switch to ON (II). 11. Measure the voltage between A/C pressure switch 2P connector terminal No. 2 and body ground. -Repair an open in the wire between the A/C pressure switch and the MICU. If the wire is OK, substitute a known-good MICU and recheck. If the symptom goes away, replace the original MICU. 12. Check for continuity between terminals No. 1 and No. 2 of A/C pressure switch. - G o to step 13. -Replace the A/C pressure switch. 13. Connect A/C pressure switch 2P connector terminal No. 2 to body ground with a jumper wire. -Check for B-CAN codes (see page 22-109). 14. Check for continuity between climate control unit connector A (28P) terminal No. 21 and A/C pressure switch 2P connector terminal No. 1. -Check for loose wires or poor connections at the climate control unit connector A (28P) and at the A/C pressure switch 2P connector. -Repair an open in the wire between the HVAC control unit and A/C pressure switch. 15. Turn the ignition switch to LOCK (0). 16. Disconnect climate control unit connector A (28P) and B(12P). 17. Measure the evaporator temperature sensor resistance between climate control u n i t connector A (28P) terminal No. 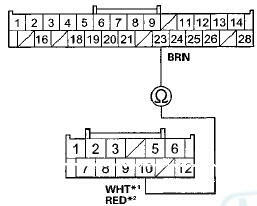 23 and connector B (12P) terminal No. 10.